Its a been written before, and shared by many, but it never hurts to have a reminder of the ways we can honor and nourish ourselves with a simple recipe. I’ve long been a fan of nourishing milk infusions of herbs, powdered, whole, blended, warm, with honey or not. I often make an infused ashwaganda, rose and cinnamon milk as a sweet and delicious way to take your daily dose of ashwaganda, and herbs are often administered in milk, or ghee, or both, in Ayurvedic herbal medicine. And really what a nice, warm, and nourishing way to take your herbs- more indulgent and comforting that just tea and can be enjoyed evening or morning. I’ve been enjoying turmeric latte’s at a local cafe, but wanted to share my homemade super version, which has the added benefit of super fresh spices, and coconut oil. milk and what have you). Grate the fresh turmeric root into your milk in a small sauce pan. Add the remaining powdered herbs and salt. Bring to a gentle, warm simmer, and the milk turns bright golden yellow. Remove from heat, add your coconut oil or ghee, and the honey if you desire, though I love it unsweetened, an herbal infused honey can also add a depth of healing medicine as well (ginger, rose, or other infused honeys are nice). 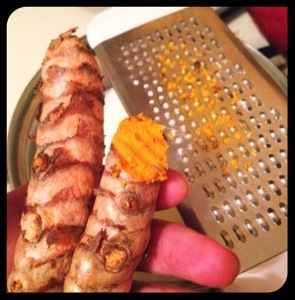 Make sure to eat and chew up all the grated turmeric root in the cup too, don’t miss that potent herbal medicine at the bottom. Turmeric is a spice well known in Indian cooking and Ayurvedic medicine that is becoming ever more revered in Western herbalism as well, as a potent anti-inflammatory, antioxidant, wound healer, anti-infective, digestive stimulant, liver detoxifier and more. It is gently warming. It is closely related to ginger, but doesn’t have quite the same spicy bite, but is infinitely more yellowy orange, and will stain, so do be careful not to get it on your clothes or counter. 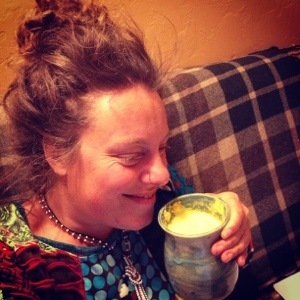 After a long day on the job, running after your kids, or when you just want a gentle and delicious way to nourish your body and soul any time of day – Sit down to a cup of hot herbal infused Turmeric Chai Latte. Rub your belly, massage your feet, annoint your temples with a sweet calming botanical perfume or essential oil and breathe. heather, if its organic not necesary. but you may like it without the peel. i don’t mind it, i drink it all down, peel and all! So delicious. Thanks so much for the reminder, and the super inspiration of your deliciously pictured post! Just drank as a nice pick-me-up with ashwagandha powder and half of a decadent vanilla bean added along with the other spices. I feel invigorated. A wonderful thing for a cold winter’s night with lots of writing to do… Thank you, thank you! I just love this. What a wonderful nourishing brew, just thinking about it makes me feel all cozy inside. Can’t wait to whip up a batch! My little girl had this link copy-pasted in my in-box. I feel challenged …might just give the recipe a try tomorrow. Wish me luck.